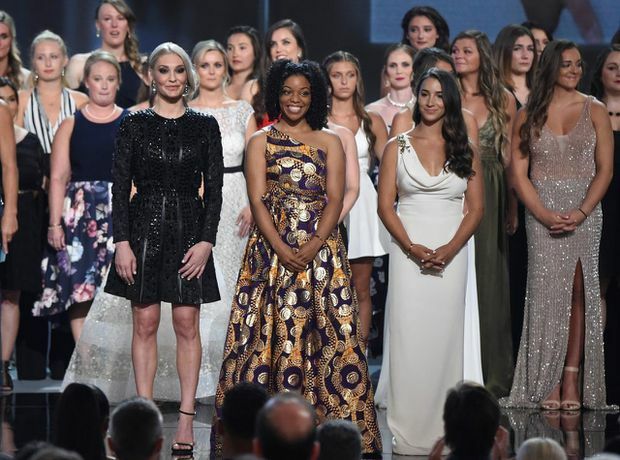 From left, in front: Former gymnast Sarah Klein, former Michigan State softball player Tiffany Thomas Lopez and gymnast Aly Raisman stand with others who suffered sexual abuse as they accept the Arthur Ashe Award for Courage at the ESPY Awards on July 18, 2018, in Los Angeles. More than 140 survivors of sexual abuse at the hands of a former USA Gymnastics and Michigan State University team doctor joined hands on stage to be honoured with the Arthur Ashe Award for Courage at the ESPYs. The women who spoke out against the abuse by Larry Nassar stood together on Wednesday night in a powerful and solemn closing to the show highlighting the past year’s top athletes and moments in sports. Kim took female athlete honours over Olympic skier Mikaela Shiffrin, WNBA player Sylvia Fowles and soccer player Julie Ertz. Kim also claimed trophies for best female Olympian and female action-sports athlete. At the Pyeongchang Games in February, she became the youngest to win a snowboarding medal when the then-17-year-old claimed gold in halfpipe. Ovechkin, who led the Washington Capitals to their first Stanley Cup championship this past season, also won for best NHL player. He beat out Patriots quarterback Tom Brady and fellow first-time nominees Jose Altuve of the Houston Astros and James Harden of the Houston Rockets for male athlete of the year. Federer’s five-set victory at the Australian Open in January for his 20th Grand Slam singles title earned honours for record-breaking performance. He also received the award for best male tennis player. White won best Olympic moment with his final-run performance in South Korea, featuring back-to-back 1440s to take gold, and best male Olympian. The Astros were honoured as best team for winning the franchise’s first World Series in the 2017-18 season. Brady claimed best NFL player, while Mike Trout of the Los Angeles Angels won for best MLB player. On a big night for Olympians, the U.S. women’s hockey team earned best game honours for their shootout victory over Canada in the gold-medal game in South Korea. Donovan Mitchell of the Utah Jazz earned breakthrough athlete honours. The Minnesota Vikings earned best moment honours for beating the New Orleans Saints on the final play of their NFC divisional playoff game. Former NFL quarterback Jim Kelly received the Jimmy V Award for Perseverance for his struggle with jaw cancer. Fellow NFL Hall of Famers Dan Marino and John Elway presented Kelly with the honour.